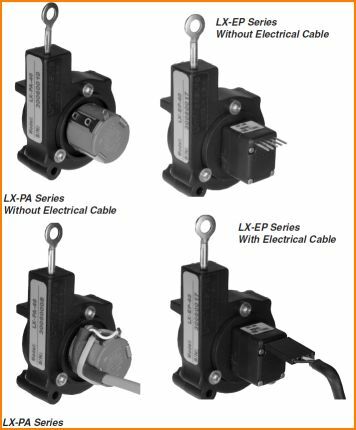 LX Series transducers are a low-cost compact device for use in light to moderate duty applications in dry environments. The plastic bodied device is ideal for high-volume OEM situations where cost is a major consideration and in applications where small size or low weight are of paramount importance. Models are available in 11 measurement ranges from 0″-2″ (50mm) to 0″-50″ (1250mm). Electrical outputs include both analog and digital. Model LX-PA is available in eleven different measurement ranges with a max. range of 50″ (1250mm). The output is voltage from a potentiometric voltage divider circuit. The sensing element in the LX-EP is an optical incremental encoder with electrical outputs consisting of two square wave, TTL level output channels in quadrature. Applications: machine building industry, medical applications, store & convey technics, loading platforms, robot positioning, float gates…..
Veröffentlicht am März 1, 2011 April 13, 2018 von vmarcusVeröffentlicht in Draw wireVerschlagwortet mit draw wire, sensor, sensor-systems, sensors, transducer. The high-quality draw wire systems expand on their proven economical standard draw wire systems with solutions for demanding applications from 0.25m up to 40m measuring length. The core of a draw wire device is a drum mounted on bearings, onto which a wire is wound. Winding takes place via a dynamic spring mechanism using a constant force spring, which allows for a high traverse speed of up to 10m/s and high acceleration of up to 140 m/s2; this proves ideal for dynamic applications and offers a long service life of approx. 2 million complete cycles. The construction is particularly robust and unaffected by environmental influences thanks to its titanium-anodised aluminium housing. The wire is made from stainless-steel with a diameter of 0.5mm and is thus exceptionally hard-wearing. The wire exit is free from wear thanks to a diamond-polished ceramic guide. The wide temperature range from -20°C to +85°C as well as the optional IP67 protection rating permit use in difficult environmental conditions. The draw wire system is suitable for various sensors and encoders with analog outputs (0 to 10V, 4 to 20mA, potentiometer), incremental (push-pull, RS422), absolute (SSI, BISS) and Field bus (CANopen®, Profibus, DeviceNet, EtherCat) interfaces. The systems have a linearity of up to 0.05% and can be supplied on request together with the relevant calibration certificate. Mounting is effected quickly using just 2 screws. The versatile housing technology allows for various mounting options. Connection is via either cable or connector. Veröffentlicht am Oktober 12, 2010 April 13, 2018 von vmarcusVeröffentlicht in Draw wire, SeilzugsensorenVerschlagwortet mit draw wire, sensor, sensors, transducer.